If you ever had been around a small child, the word “Why” can become the most frustrating word you’ll ever encounter right after “No”. Every answer you give is quickly challenge with another “Why” until you have no more answers and you snap with the default answer of “Because!” But before you snap, remember to keep telling yourself that this is a critical process in the development of that child. Being inquisitive is how we all learn and grow intellectually. Problem solving may have been the original application, yet this same technique can also be adapted to an earlier stage of development of an idea or perceived innovation. Asking the 5 Whys at the beginning of a project can reveal many aspects that may be overlooked. Like a small child asking why, it is important to understand the idea’s purpose. Finding its purpose, will help determine the viability and adaptability of the idea. Below, is a graphic I use to help determine my continuation of an idea. Start with “Why do it?” Walk around the circle and ask yourself each question as it relates to your idea or situation. If at any time, you do not have a strong and clear answer to any one of the 5 whys around the circle, then, as you get back to the beginning, ask yourself the first one again. There are two steps you can take from here; the first is to uncover the answers to each question or move away from the idea (for now). Record the idea and store it until all the answers can be found. I have come to believe and trust this method when developing an idea before investing time and resources. Too many times I committed to a project that either served no greater value to the existing condition or would never be accepted as a new solution. 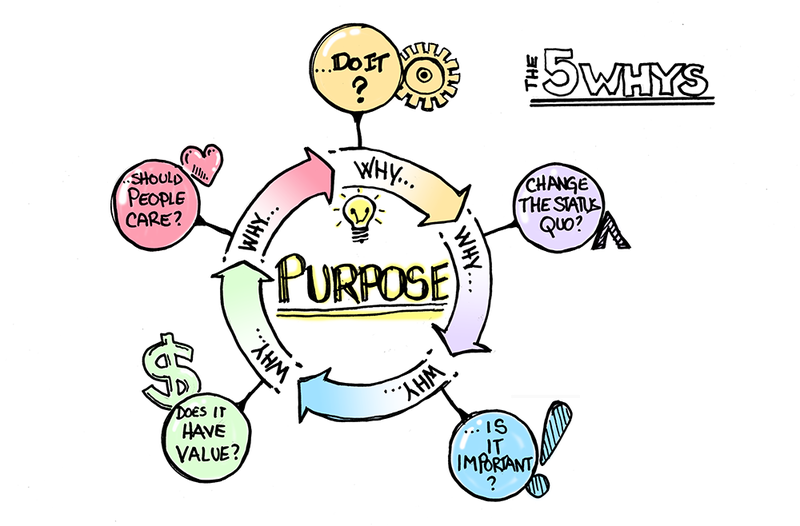 I dedicated many hours and resources keeping a project moving simply because I was blind to the answers I would have discover had I only simply asked these five whys.